Pool size is determined by three factors: cost, size of the yard, number of users and their swimming style. The shape is limited only by the imagination. 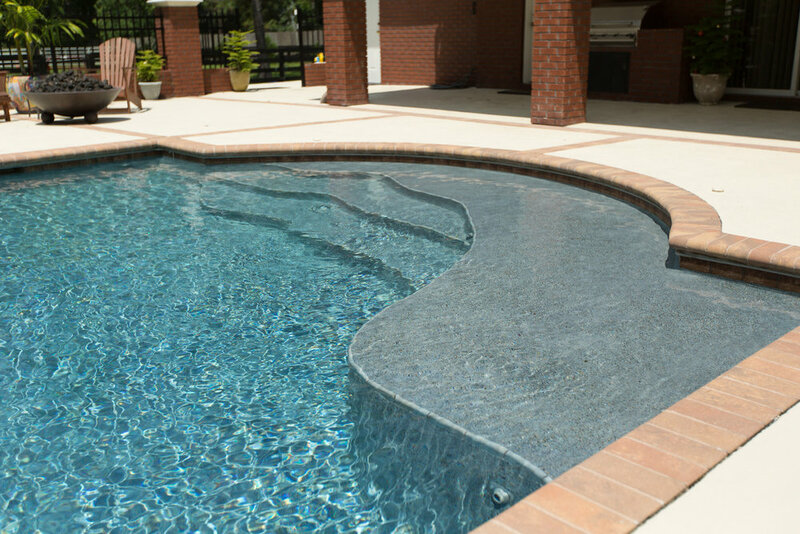 We design our pools specifically to meet the customer’s lifestyle and desires. In terms of size, style, shape, etc., it really depends on how you intend to use your pool. If exercise is most important, maybe a lap pool will be best for you. If want your pool to reflect a backyard oasis for entertaining, relaxing or overall enjoyment, then a freeform or lagoon style pool will be best. Visit our gallery for pool ideas. The two energy efficient products we use on every pool are Pentair’s LED light and the variable speed pump. We are constantly searching for new ways to make our pools as environmentally friendly and energy efficient as possible. Brick paver decking adds another dimension of beauty and enjoyment to the pool area. It should be designed with generous areas to allow for safe comfortable movement around the pool. Other decking considerations might include the use of the pool area for special occasions and also for placement of outdoor furniture. Backyard Designs, Inc. offers a wide range of the highest quality interlocking pavers to provide long lasting beauty and charm to your pool deck. You will have the pleasure of choosing the color and pattern for the ceramic tile that surrounds the inside of the pool at the waterline. This trim makes for easy cleaning and adds a beautiful stain-free trim that greatly enhances the aesthetic value of any size or shape of pool. We primarily use Pentair products because we love their performance and energy efficiency. While no pool can be considered truly “zero maintenance,” we’re getting closer and closer all the time, thanks to many new features and developments. Great minds in the industry have been working hard to take the drudgery out of swimming pool ownership. Check out some of these “secrets” that will make your swimming pool practically take care of itself. With computer automation, all the advanced controls of your pool can be put in the palm of your hand – literally. From pumps to lights to water features to sound systems to anything else you can think of, these modern controllers allow you to adjust any and all functions without ever getting up out of your chair or out of the pool. Naturally, these controllers are waterproof, so you can leave them floating in the pool or spa, or wherever you want. Most people have a second controller installed in the house, so they can make adjustments without ever going outside. The other advantage of the new modern controllers is that the equipment can be programmed for optimum efficiency throughout year. We are one of only two authorized pool builders in northeast Florida that can install the Paramount’s state of the art Cleaning & Circulation System, PCC2000. The filter is the heart of your swimming pool. A cartridge filter, which is standard on our pools, has a removable and re-useable polyester cartridge which removes dirt and debris as the water passes through several pleated layers. Cleaning the filter is accomplished by simply removing the cartridges and rinsing with a garden hose. Another filtration system which is available as an upgrade is the diatomaceous earth (D.E.) filter. The D.E. filter has proven to be the most dependable and trouble-free system available. It makes use of a series of nylon fabric covered grids. D.E., a natural earth powder, is added to the system which adheres to the grids. This powder microscopically cleans the water, collects dirt and allows for a high rate of water flow. Cleaning the filter is accomplished by reversing the water flow through the filter, a flip of the switch and within 90 seconds the filter is clean. The filter system installed by Backyard Designs will provide clean sparkling water with a minimum of maintenance. The entire volume of water in the pool should pass through the filter within an eight-hour period. The latest development in automatic cleaning is “in-floor cleaning.” Somewhat similar to an automatic sprinkler system, these nearly invisible pop-up heads automatically drive all dirt and debris down to the drain and out of the pool. Paramount Pool & Spa Systems developed the PCC 2000 Cleaning and Circulation System. There’s also “robotic cleaning,” which involves an automated cleaner working its way around your pool during its cleaning cycle. Variable Speed Pump – The Intelliflo Variable Speed Pump by Pentair includes a variable drive, digital controls and Proprietary software that allow custom programming of the optimum speed per function – filtering, heating, cleaning, operating water features – for even greater savings…up to 90%. High Performance Heater – The MasterTemp high performance heaters offer best-in-class energy efficiency. Plus, they are certified for low NOx emissions, making them eco-friendly favorites. IntelliChlor Pentair Salt System – Maintaining your pool has never been easier. Imagine, no more buying chlorine, nor more manually adding acid, no more water chemistry worries. CLI Industries products installed by Tempools is the only pool finish we use.